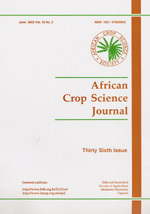 The African Crop Science Journal, a quarterly publication, publishes original research papers dealing with all aspects of crop agronomy, production, genetics and breeding, germplasm, crop protection, post harvest systems and utilisation, agro-forestry, crop-animal interactions, information science, environmental science and soil science. It also publishes authoritative reviews on crop science and environmental issues by invitation. The Journal also accepts "short communications" dealing with original results not warranting publication as full papers, book reviews and has an advertisement section. To encourage dialogue on topical issues, the Journal has a "Forum" section. It is bilingual, publishing in either English or French.